Paella for Preservation is sold out! 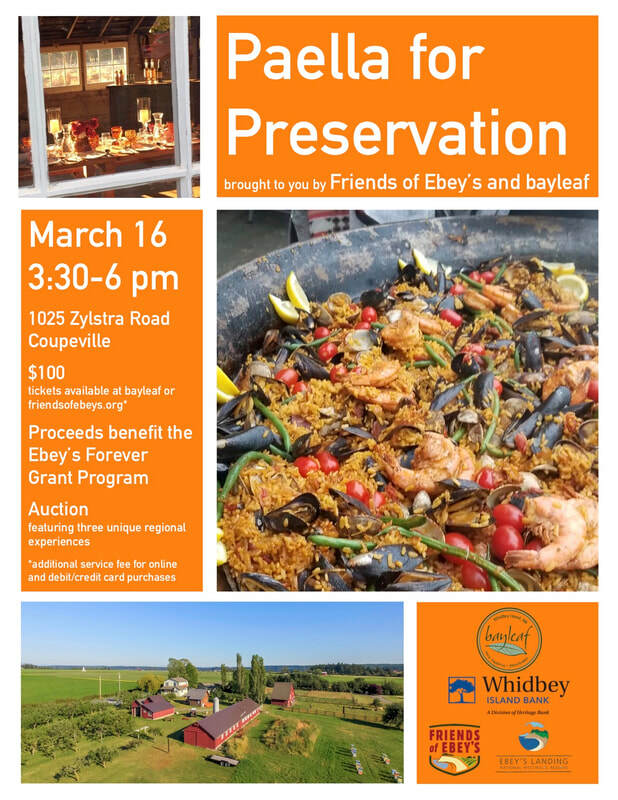 Friends of Ebey's and Coupeville's bayleaf are joining fundraising forces to benefit the Ebey's Forever Grant Program, helping to fund the preservation of treasured historic buildings throughout Ebey's Reserve. Join us in the Eckholm Farm's restored barn for a bayleaf paella experience, while witnessing firsthand how your support brings historic structures back to life. Savor delectable paella (featuring chicken, chorizo, mussels, prawns & vegetables) cooked over an open fire as we toast to Ebey's Forever. There will be a small auction offering three unique regional experiences. Thank you for supporting the Ebey's Forever Grant Program, which has invested approximately 1.2 million dollars into historic structures of the Reserve and also the local economy. Friends of Ebey's will award the Reserve's Trust Board another $50,000 for the 2019 grant cycle. There are a limited number of tickets available for this event. Purchase tickets at bayleaf (cash or check) or online (service fee applies to online/credit card purchases) above. ​ Be sure to wear comfortable shoes! Contact alix@friendsofebeys.org or call (360) 678-6633 with any questions.